Just a bit of housekeeping to begin with! In case you haven’t noticed, I now have a “Recipe Box” tab at the top of my page. I’ve tried to categorize my posts as succinctly as possible so that you can search for recipes easier. The WordPress search box just wasn’t working so well. Let me know if you have any suggestions for how to improve it! FOR the last two years, Rachel Muston, a 32-year-old information-technology worker for the Canadian government in Ottawa, has been taking steps to reduce her carbon footprint — composting, line-drying clothes, installing an efficient furnace in her three-story house downtown. As an eco-conscious individual, I’m always looking for good ideas on how to reduce my carbon footprint. I learned a lot of good tricks from the Hrens this past summer (in the summer don’t open the blinds/curtains during the day to keep the house cool, how to grow mushrooms in a spare kitchen cabinet, etc.) and I’m a big fan of local, organic food (hooray for Margie and Vegetable Husband! ), but I’m just not sure what I think about this article. I tend to cook big batches of food and refridgerate them so I can eat all week. Since I don’t have a microwave, thawing soups and other food can be hard in a time crunch in my oven or on my stove. The benefits of not having a fridge seem shady too–and why do fridgeless people use a freezer? These are questions I’m going to research, but I’m wondering what you all think! Now onto the recipe! Oh look, it’s cabbage soup take 2! The Russian Cabbage Soup called for 3 cups of cabbage, which worked out to exactly half of the cabbage I had in my possibly ungreen fridge, so I decided to use this recipe from Heidi at 101 cookbooks to use up the other half of the cabbage. I buy dry beans, so I soaked them overnight and then threw the soup together about one hour before I wanted to eat. The recipe is so simple, cheap, and quick, especially if you have a can of white beans sitting around, and it’s the perfect fix for a cold night. Served with a chunk of whole wheat bread, you certainly can’t go wrong. Warm the olive oil in a large thick-bottomed pot over medium-high heat. Stir in the salt and potatoes. Cover and cook until they are a bit tender and starting to brown a bit, about 5 minutes – it’s o.k. to uncover to stir a couple times. Stir in the garlic and onion and cook for another minute or two. Add the stock and the beans and bring the pot to a simmer. Stir in the cabbage and cook for a couple more minutes, until the cabbage softens up a bit. Now adjust the seasoning – getting the seasoning right is important or your soup will taste flat and uninteresting. Taste and add more salt if needed, the amount of salt you will need to add will depend on how salty your stock is. Let simmer for 30-45 minutes. Serve with bread. ooh, i have some leftover cabbage! good idea. There’s nothing like a hearty bowl of soup on a cold winter day, Jes! I’m going to give your quick recipe a try, thanks. Yummy, chunky, cold-weather soup! I’m not sure how unplugging one’s refrigerator is “going big”, but more power to them if they can make it work. Oh, and the recipe box looks great!! any soup with cabbage is my kind of soup. thanks for the recipe! MMM. I just LOOOVVVEEE soup! that being said your soup looks too yummy! i’m going to have to try this recipe, Jes! it looks amazing! i’m all about more cabbage yumminess! mmmmmm! we’ve also been trying to reduce our impact, but we’re on the same page as you with the whole fridge thing. i cook a lot of sundays & store stuff in the fridge to reheat later. i figure with all the other low impact things we do (using recycled toilet paper & tissues, composting, bar shampoo, vegan lifestyle, recycling & reusing, making our own bread & such, reusing grey water, klean kanteen, re-usable shopping bags, & lots more) – leaving our fridge plugged in is okay! but crunchy chicken has some thoughts on all this & i think she makes some good points, too! p.s. – i’m with you on the cooler weather. i’m not one for summer & all the heat. if fall & winter were here to stay i’d be one happy lady! fo ‘sho! Now I’ll know what to do next time I take a head of cabbage home from work. While I wouldn’t have thought to try cabbage soup, this version definitely looks far more tasty than most! I also have some cabbage leftovers in my fridge, thank you for the recipe. Well, sometimes I thought of unplugging the fridge during winter. I think if we had a balcony I totally would. 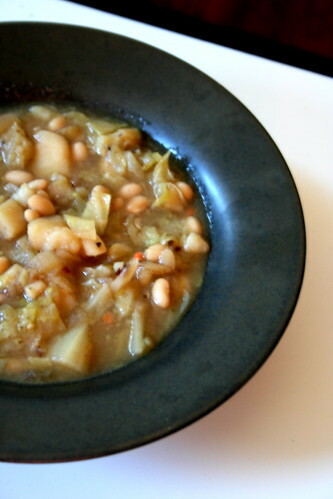 I never thought i would think cabbage soup looked good – but it does!! I dunno about unplugging the fridge. Cooking for 1, I often make enough for leftovers and keep it in the fridge.